Things got spooky this Halloween as VJ Scott Guy, projection master at EMD, used AV Stumpfl Wings Vioso media serving software to calibrate, warp and blend horrific and scary graphical imagery onto the façade of Toronto’s Casa Loma as part of Liberty Entertainment Group’s Legends of Horror. Casa Loma, Canada's largest home built by Sir Henry Pellatt, is a historic site open daily to the public and for private events in the evenings. A highlight of the production is the 3D projection on the 90,000 square foot exterior of the castle, which brings the characters of the storyline and the walls of the castle to life. These include Dracula rising from his crypt, to the Creature from the Black Lagoon slithering in the swamp and the Phantom of the Opera. VJ Guy was brought in to perform the projection mapping onto the façade of the historic building. 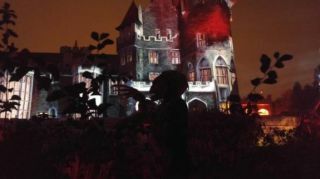 Legends of Horror’s presentational form is considered promenade theatre, in which the audience walks at their own pace through a 1.2 km trail commencing in the lower gardens of Casa Loma and winding its way through the historic buildings tunnels anddarkest spaces. The show spooked guests every night during October and will be returning annually.